We're a Kleenex kind of household. At this moment, you can find boxes of tissues in at least five different rooms of our house. In the winter and spring, you'll find even more. I guess we sneeze a lot. I don't like having naked boxes of tissues around. I know that tissue manufacturers try to make the boxes attractive; I guess I'm sensitive about tissue box decor. But I'm also sensitive about how much tissue box covers cost at retail stores. Yikes! I'm quite happy with my new tissue box cover! Not bad at all for 99 cents. Meanwhile, I came up with another use for an empty tissue box. I use it to store empty plastic bags. I have half a dozen re-usable bags, but I often forget to take them into stores with me. I find that plastic bags are useful for many different things, but storing them has been a challenge. Solution: stuff them down into an empty tissue box. 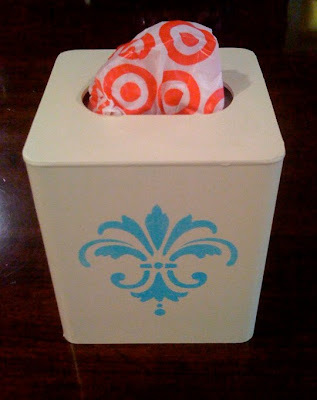 And if you have a 99-cent decorative cover for your tissue box, you can have a plastic bag dispenser that's useful and pretty! Now that is very creative.....and it turned out great. What a wonderful idea.....thanks for sharing it today. Cute box and what a great idea for those plastic bags. I'll be on the lookout for a thrifty tissue box now! Cute! I'm actually the same way with the boxes. 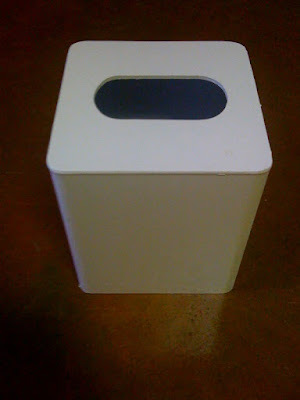 I'm always looking for kleenex boxes from thrift stores to decorate. I'm weird and I only like the rectangle shaped boxes so those are even harder to find! How cute. I love the idea for the extra plastic bags too, currently I have a cupboard that is filled to the brim with them. I love this idea. thanks for sharing! That is SUCH a good idea!!! That is so much cuter than my giant wad of plastic bags shoved under my sink. 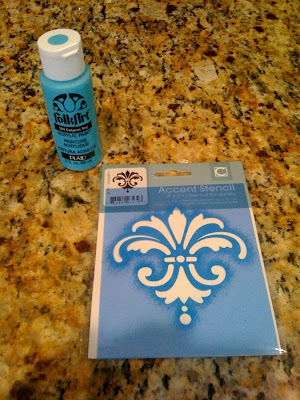 ;) Totally linking to this for Weekend Bloggy Reading tomorrow! What a good idea to use them for plastic bags! Too cute! What a great idea! I don't like the plain jane boxes either. That turned out so good and what a great way to store your bags. Amazing what spray paint can do. Love & blessings from NC! I can relate to sneezing with my allergies going crazy right now. What a great idea! I keep my bags stuffed in a junk drawer. This would be way cuter :). I have bad allergies so I love any idea to cover boring tissue boxes. I am the same way with forgetting my reusable grocery bags in the car. Alot of good that does, huh? Visiting by way of Fingerprints on the fridge. That is a great idea too. I used a cleaning container for my bags:-) I am coming from Fingerprints on the Fridge Friday hop. I'm now following your lovely blog. Hope to see you at Inspirations by D too. Blessed weekend. I love this idea. My plastic bags are out of control! Love this idea, how adorable! Found you from Fingerprints on the Fridge, would love to have you stop over for a visit!